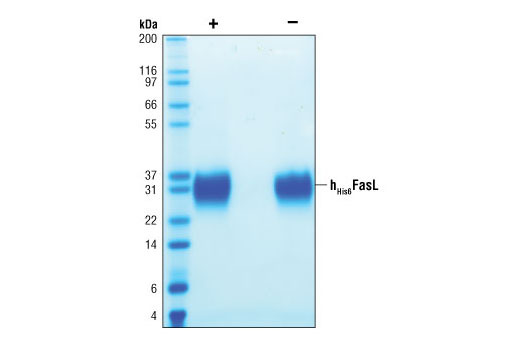 The purity of recombinant hHis6FasL was determined by SDS-PAGE of 6 µg reduced (+) and non-reduced (-) recombinant hHis6FasL and staining overnight with Coomassie Blue. The viability of Jurkat cells treated with increasing amounts of hHis6FasL in the presence of 10 µg/ml anti-His antibody was assessed. After 24 hour treatment with hHis6FasL, cells were incubated with a tetrazolium salt and the OD450 - OD650 was determined. 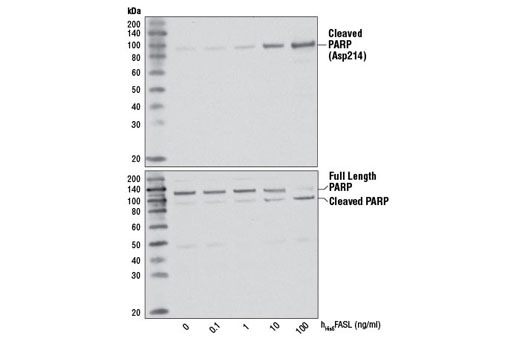 Western blot analysis of extracts from Jurkat cells, untreated or treated with hHis6FasL for 3 hours, using Cleaved PARP (Asp214) Antibody (Human Specific) #9541 (upper) or PARP Antibody #9542 (lower). Treatment of Jurkat cells with hHis6FasL induces casapase-3 cleavage as detected by PathScan® Cleaved Caspase-3 (Asp175) Sandwich ELISA Kit #7190. Recombinant humanHis6 FasL (hHis6FasL) Pro134-Leu281 (Accession #NP_000630) was expressed in human 293 cells at Cell Signaling Technology. >98% as determined by SDS-PAGE of 6 μg reduced (+) and non-reduced (-) recombinant hHis6FasL. All lots are greater than 98% pure. Recombinant N-terminally His6-tagged hFasL has a calculated MW of 19,834. DTT-reduced and non-reduced protein migrate as 31-36 kDa polypeptides. Lower mobility in SDS-PAGE is due to glycosylation. 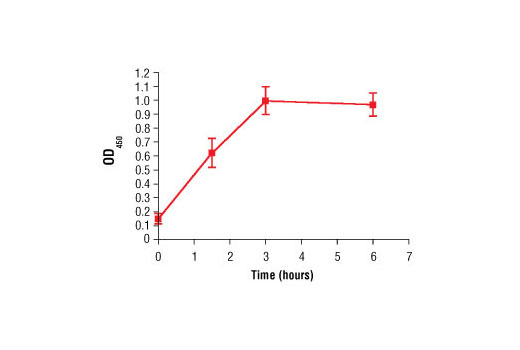 The bioactivity of hHis6FasL was determined in a Jurkat cell viability assay. The ED50 of each lot is between 1-5 ng/ml. Less than 0.01 ng endotoxin/1 μg hHis6FasL. FasL is a member of the TNF-superfamily family of proteins and is expressed primarily on the cell surface of activated T and NK cells (1). FasL regulates the immune response through its ability to induce apoptosis. The immunoregulatory role of FasL is underscored by lymphoadenopathy associated with FasL or Fas knockout mice and the fraction of autoimmune lympho-proliferative syndrome (ALPS) patients that have mutations in the FasL receptor, Fas (1). 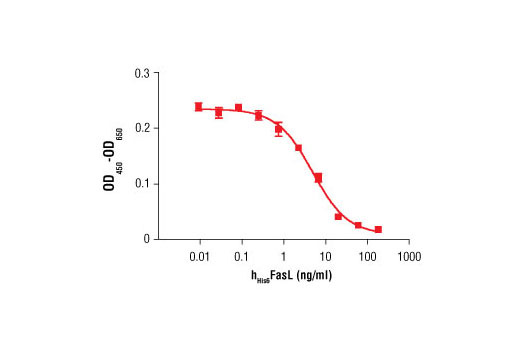 FasL is a membrane protein that can be cleaved into a soluble trimeric form by metalloproteinases (1,2). The soluble form of FasL retains the ability to bind to Fas, however, its ability to induce apoptosis is diminished (2). The ligation of Fas by FasL leads to the assembly of death-inducing signaling complex (DISC) and the recruitment and activation of caspase-8/caspase-10 (1,3). Active caspase-8/caspase-10 subsequently activates the “effector” caspases caspase-3 and caspase-7, and cleavage of BID (1,3). Strasser, A. et al. (2009) Immunity 30, 180-92. Schneider, P. et al. (1998) J Exp Med 187, 1205-13. Guicciardi, M.E. and Gores, G.J. (2009) FASEB J 23, 1625-37.